If your sense of style can be described as orderly, conservative and formal, if you’re attracted to things timeless, classic and sophisticated, welcome home. Welcome to the Stately Elegance lifestyle. Its roots lie in the stately elegance and historic character of the Tudor, Georgian and Colonial homes of the 18th and 19th century. Homes of luxury and refinement, where style and substance are passed down from generation to generation. These are residences of grand simplicity, subtle glamour and inviting warmth, with rooms that are formal and functional, elegant and entertaining, timeless and tasteful. 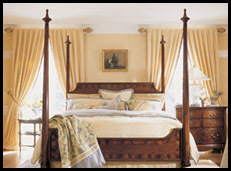 Among the most popular Stately Elegance variations are French Country and Colonial Revival. French Country celebrates the casual with colors of blue and yellow grounded by warm earth tones. It mixes old with new, vintage fabric, textured rattan chairs, pine wood tables and wrought iron accessories. 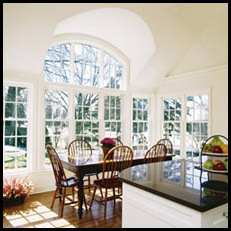 Colonial Revival hails from 18th century England and dominates the designs of American furniture. Its hallmarks are the classic Chippendale chair, cherry wood 4-poster bed and an exquisitely carved dining room table. Regardless of which variation of Stately Elegance that is reflected in you, decorating and design emphasizes order and symmetry. Your rooms express balance: two family heirloom vases, one on each end of a crisp white mantel; two over-stuffed armchairs flanking a fireplace. 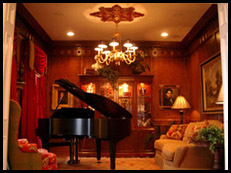 Your Stately Elegance home showcases areas of warm, inviting wood flooring and a mix of antique furniture, quality reproduction art and sentimental family collections enhance rooms. Your home’s palette is stately and regal: deep reds and vibrant blues comfort and complement; rich golds and royal purples color your world. In your Stately Elegance kitchen, dark cherry cabinetry, with traditional door style, is a key ingredient. Solid, enduring granite is the recipe for countertops, and the tile is marble -- stately yet subtle. This is the Stately Elegance lifestyle. Your way of living.